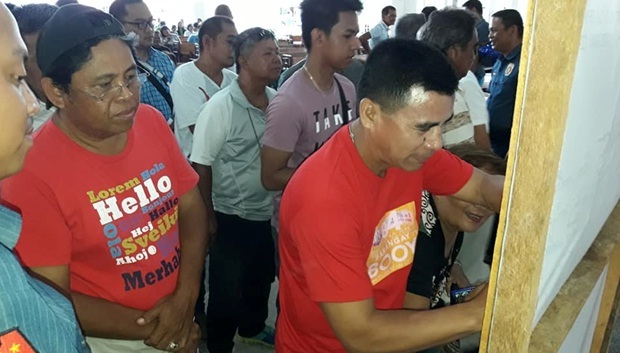 Candidates for the synchronized Barangay and Sangguniang Kabataan elections in Tagbilaran City signed the “Peace Covenant” on Thursday. The candidates gathered at the Cogon Shrine at 9:30 a.m. for the activity. The Philippine National Police (PNP) earlier went around Bohol to ask candidates to sign the covenant. Candidates in Antequera had their turn to sign the covenant last Saturday at the Antequera Training Center. Candidates in Candijay had theirs on April 29 at the St. Joseph Parish in the town. The PNP has been deputized by the Commission on Elections (Comelec) to initiate the Peace Covenant signing as part of the comprehensive security plan. The PNP’s comprehensive security plan is aimed at ensuring safe and fair conduct of the synchronized Barangay and SK Elections on May 14. Comelec Provincial Election Supervisor Elesio Labaria, Comelec Regional Election Supervisor Veronico Petalcorin, Police Provincial Director Angeles Geñorga Jr. yesterday led the send-off ceremonies for troops deployed to secure the elections this Monday. The send-off ceremony at Plaza Rizal in Tagbilaran City was also attended by Acting Vice-Governor Venzencio Arcamo, Provincial Administrator Alfonso Damalerio II, and city officials. There were 28,205 candidates who filed their certificates of candidacy for the barangay and SK elections. Of the aspirants for the position of punong barangay in entire Bohol, 336 are running unopposed. It is only in Anda that all the candidates for punong barangay have contenders. In the first district, the barangays with unopposed candidates for punong barangay are Bahi, San Agustin, Toril, and West Poblacion in the town of Alburquerque; Can-omay, Quinapon-an , Santo Rosario, Tabuan, and Villa Aurora in Antequera; Poblacion 1, Poblacion 2, Abucay Norte, Abucay Sur, Badiang, Bahay-Bahay, Cambuac Sur, Can-agong, and Libjo in Sikatuna; Abucayan Sur, Banlasan, Cabayugan, Camias, Mandaug, Sampoangon, San Isidro, Tinibgan, and Tultugan in Calape; Boyog Proper, Boyog Sur, Cabad, Del Carmen Norte, Del Carmen Sur, San Isidro, Santo Niño, Tagustusan in Balilihan; Agahay, Dipatlong, Punsod, and San Vicente in Maribojoc; Bolod in Panglao; Cambanac, San Isidro, and Montaña in Baclayon; Malayo Norte, Poblacion, Lourdes, Dela Paz, Monserat, and San Roque in Cortes; Dao, Cogon, Tiptip, and Mansasa in Tagbilaran City; Poblacion, Mahayag Norte, Mahayag Sur, Sinakayanan, Triple Union, Kang-iras, Cambailan, and Bongbong in Catigbian; Sambog, Anislag, and Cancatac in Corella; Bahi, Cabacongan, Campatud, Candaigan, Canhangdon, Canigaan, Cansubayon, Cantam-is Baslay, Catagbacan Norte, Genomoan, Lintuan, Moto Sur, Nueva Vida, Pondol, Sondol, Song-on, Talisay, Tontonan, and Tubodacu in Loon; Bagongbanwa Bosongon, Buenos Aires, Cabulijan, Macaas, Mocaboc island, Pinayagan Sur, and Pooc Oriental in Tubigon; and Tabalong in Dauis. In the second district, the barangays with unopposed candidates for punong barangay are Puerto San Pedro and Tuboran in Bien Unido; San Francisco; San Jose, Magsaysay, and Guindacpan in Talibon; Alumar, Banacon, Buyog, Cabasakan, Handumon, Jandayan Sur, Mahanay, Pandanon, Saguise, Salog, San Jose, Poblacion, and Taytay in Getafe. In San Isidro, the barangays are 1.Abehilan , 2.Cansague Norte, 3.Caimbang, 4. Baryong Daan, 5.Cabanugan. In Sagbayan, the barangays are Calangahan, Canmaya Centro, Canmaya Diot, Kagawasan, Langtad, Libertad Norte, Libertad Sur, Poblacion, Sta.Cruz, San Vicente Norte, San Vicente Sur, and Ubojan. 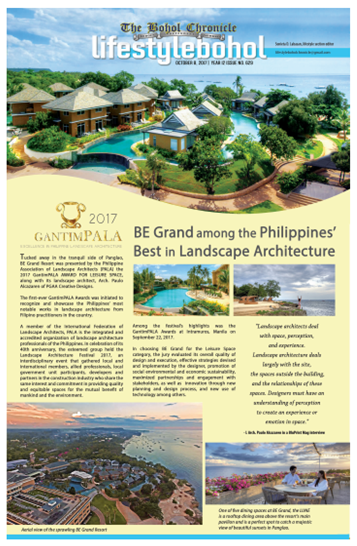 In Ubay, the barangays are Benlie, Biabas, Buenavista, Camali-an, Gabi, Humay-Humay, Lomangog, and Tubog. Dagohoy, the barangays are La Esperanza, Malitbog , Santa Cruz, and Villa Aurora. In Danao, the barangays are Magtangtang, Ibale, San Miguel, Poblacion, Santa Fe, and Dagohoy. In San Miguel, the barangays are Caluwasan, Garcia, Kagawasan, Tomoc, Mahayag, and San Vicente. In President CPG, the barangays are Cabangcalan, Aguining, Timbulo, and Tugas. In Trinidad, the barangayas Bongbong and Santo Tomas. The other barangays in second district are Poblacion , Cawayan, Ilaya, Lonoy Cainsican, Riverside, Anonang, Dagnawan, Ilihan, Lutao, Badiang, Dagohoy, Lapacan Norte, Mabuhay, Cagayan, Datag, Lapacan Sur, Ma. Rosario, Calinte, Fatima, Liloan Sur, and Ondol in Inabanga. In the third district, the barangays are Garcia, Poblacion Sur, Rizal, Rosariohan, and Santa Cruz in Batuan; Bugang Norte, Cambigsi, Cansumbol, Rizal and Roxas in Bilar; Canlambong, Guindaguitan, Bauhugan, Cambayaon, Limokon Ilaud, Casingan, Datag, Banban, Banban, Taongon Cabatuan, and Taongon Can –andam in Dimiao; Taytay and Angilan in Duero; Bayong, Biabas, and Bato in Guindulman; Casilay, Danicop, Dusita, Salvador, Cahayag, San Jose, and Nan-od in Sierra Bullones. The other barangays in third district are Abaca, Baybayon, Cabidian, Concepcion, Poblacion, Del Mar, Minol, San Isidro, San Jose, and Tambo in Mabini; 1.Katipunan 2.Sudlon 3. Del Monte in Alicia; 1.San Isidro 2. Tugas 3.Cadapdapan in Candijay; 1.Poblacion Norte 2. Villarcayo 3. Bicao 4. El Progreso 5. Guadalupe 6. La Victoria 7. Montesuerte 8. Monte Video 9. Nueva Vida Este 10.Nueva Vida Norte11.Nueva Vida Sur 12. Tamboan 13. Vallehermoso in Carmen. In Garcia Hernandez- -1.Abijilan 2.Cagwang 3.Catmon 4.Datag 5.Estaca 6.Libertad 7.Sacaon 8.East Ubujan 9.Victoria. In Loay- -1.Agape 2.Alegria Sur 3. Poblacion Ubos 4.Tayong Occidental. In Loboc- -1.Bagumbayan 2.Bonbon lower 3.Bonbon Upper 4.Bugho 5.Cabadiangan 6.Calunasan Sur 7.Camayaan 8. Candabong 9.Candasag 10. Canlasid 11.Jimilian 12. Oy 13.Poblacion Ondol 14. Quinogitan 15.Taytay 16.Tigbao 17 Ugpong 18.Villaflor.